Somewhere between Flavia de Luce novels and Downton Abbey, I lay blame for my renewed adoration in all things English. And then of course, there was the Diamond Jubilee this month and soon the Olympics in London...it's so exciting, I've adopted a tea time ritual at the shop most evenings. 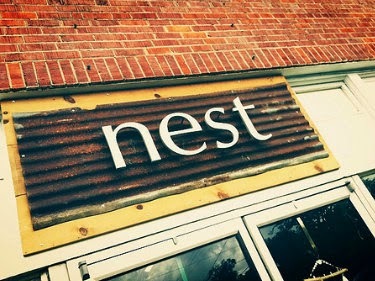 Pausing over tea, I've realized quite a few projects this year have been inspired by these events. 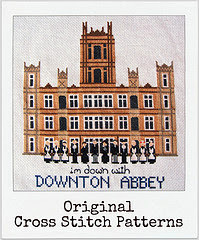 My popular Downton Abbey cross stitch pattern, released a few months back might be my favorite. Not far behind, is my Union Jack Pillow...this one I made for myself; I have some tweaking to do before I release it for sale in the shop. My newest favorite, though, is a one of a kind tote. 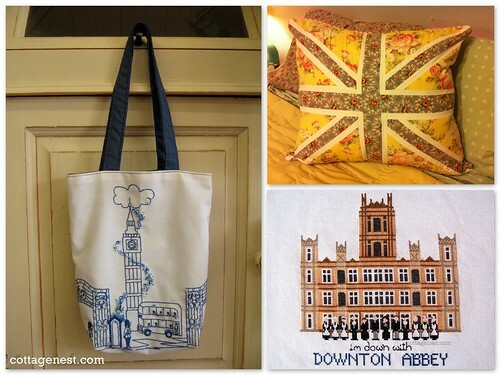 I had the luck to find a vintage fabric embroidered with a whimsical London street scene including Big Ben, a double decker bus and Buckingham Palace gates. I added some lovely bead work to the front and sewed into a useable bag. What are you doing to celebrate the latest British Invasion?